Smoke rises from the sugar shack as volunteers begin to boil sap. 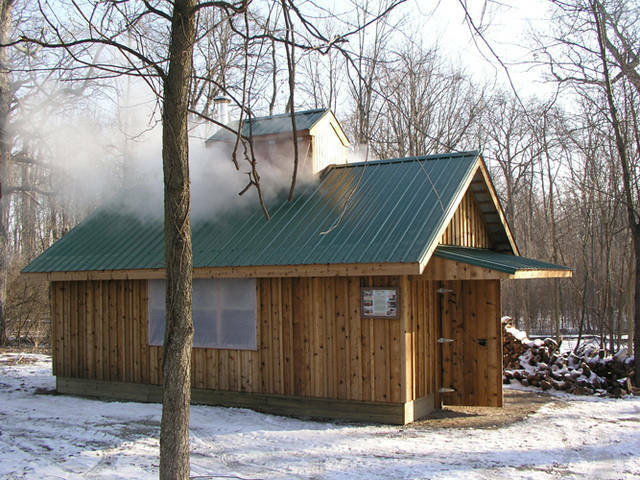 GREENVILLE – This week the maple sap has started to run, and many Darke County Parks volunteers have fired up the sugar shack for the maple sugaring season. Freezing nights and thawing days cause the sap to move, bringing the sweetness one step closer to the table. For some volunteers it will be just another February; for others it’s an opportunity to learn a new skill and help out the park district at the same time. The Maple Sugarin’ at the Prairie Festival will be held beginning at 8 a.m. March 2. This late winter day at Shawnee Prairie offers guided tours through history and science, learning the process of turning sap into syrup. After the tour through the woods, guests can visit the sugar shack and warm up in the steam-filled evaporator room as the sap spends numerous hours on a boil to reduce it down to syrup. Guests then can head out to the log house and blacksmith shop to visit with the early settlers and discuss life on the frontier. Finally, guests can complete the day at the Nature Center where the gift shop and bake sale will be full of maple goodies fit for any sweet tooth. The Friends of the Parks once again will serve up a hearty breakfast of waffles, sausage, juice, coffee and of course pure Ohio maple syrup. Adult tickets are $6 and children 3-12 are $3. Carry-out is available, and extra sausage can be purchased for $1 more. Breakfast will be served from 8 a.m.- noon. Tickets will be available at the door on the day of the breakfast or pre-sale tickets may be purchased at the Nature Center. Individuals can call 937-548-0165 for more information.